If you are looking for information on the WorldWide Wireless franchise business opportunity, WorldWide Wireless cellular franchises or WorldWide Wireless franchising , then you have come to the right place. Thank you for taking a closer look at WorldWide Wireless! 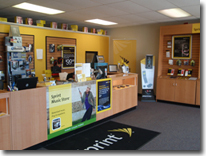 At WorldWide Wireless, we have created a great niche among the big box retailers, as well as other cellular franchises. What is it, then, that sets us apart? What allows us to confidently back our company motto, "Where Service and Added Value Connect"? The answer is simple: We specialize in one carrier, which enables us to be experts when talking to our customers, educating our sales staff, and training our franchisees. This approach makes our program simpler to manage and easier to staff, while creating a one-on-one working relationship with our carrier - Sprint/Nextel. One carrier means it's less costly to start-up a franchise - we can in-store stock all phones. No waiting for our customers to activate their phones means no waiting for us to generate a sale! We are able to in-store stock most accessories that accompany the phones we sell, including the latest in Bluetooth technology. Greater accessory selection equals more sales volume for franchisees! We receive carrier promotions not offered to multi-carrier locations. It is easy to keep informed and up-to-date on products, rate plans, data solutions, etc. which results in a high quality of customer care. Most of all, we are not just sales clerks, but rather cellular consultants. Being exclusive, we have key relationships that keep us ahead of other multi-carrier franchises. Of course, in today's fast-paced world of technology, being a communications expert goes beyond the realm of mobile phones. Our sales staff is trained to assist customers when making wise decisions on data solutions such as email, GPS navigation and much more. When customers come through our doors they are given knowledgeable sales assistance, making them feel confident that they have made the best, well-informed choice. Again, we can proudly stand by our motto, "Where Service and Added Value Connect." In addition to training at our corporate office, our training team will come to your location and help you get started. Our vendor relationships create lower costs. Large volume purchasing and WorldWide Wireless' excellent credit standing give us preferred customer status with our vendors. We are always looking for new and exciting products to compliment our current lineup of products. Our franchise program is truly a "win, win" for you and any customer that comes to a WorldWide Wireless location. You win because your business will hit the ground running. The customer wins because they receive the "added value" that comes from being served by the highest quality of trained specialists in the field of cellular communication. This plan invites you to be directly involved with the development of your location from start to finish - from selecting your site through to opening day, WorldWide Wireless will walk along with you as you become your own wireless retail store owner. Our experienced franchise development team will complete all the steps necessary to allow you to simply get the keys and open for business. The same training as a basic franchise is required, but the waiting period for income generation is greatly reduced. This plan allows for the purchase, development and expansion of a geographical territory. Our corporate office will help you build your own network of WorldWide Wireless locations. No matter which you choose, WorldWide Wireless is committed to seeing you through every step, and doing whatever we can to ensure your success as a business owner. Please consider joining our family. Take a minute to Click the button below and we will send you complete franchise information as quickly as possible. Thank you again for your interest in our company.